Nigel Farage (UKIP Leader) doesn’t like the Eurozone. And he doesn’t want a United States of Europe. And he blames the Euro and the whole Eurozone concept for the coming Greek default. I picked one. I suggest you go to the website and check out on multiple Nigel Farage videos available on YouTube. The Worm as Turned, for example. He’s a bare-knuckles critic of the whole Euro project. I’ve been promising lmsinca a post on MedPAC for quite some time. They’re meeting again next week and will have a session (benefit redesign) that I think will be of more interest. So I’m going to combine the two meetings into one post. Just like the rest of the program, a small percentage of Part D (the drug benefit) beneficiaries account for the majority of program spending. For Part D, 8 percent account for 40 percent of total spending and 20 percent of the total prescriptions. In 2009, on average the “high-cost” beneficiary filled 111 prescriptions over the year. Each prescription cost an average cost of $110. The lower-cost beneficiaries, by comparison, filled 41 prescriptions at a cost of $42 each during the same time period. “High cost” tended to use more brand-name drugs (as opposed to generics). It’s the same story over and over. There’s a small percentage of beneficiaries who are the cost drivers. Until we figure out how to control costs in this area the rest is rearranging the deck chairs. Also, Medicare is estimated to reach six percent of GDP by 2040, and the Hospital Insurance Trust Fund will be unable to pay full benefits after 2024. That’s 13 years from now. The growth in expenses means that a beneficiary’s average out-of-pocket costs will increase faster than Social Security benefits. Update: Slight edit to answer lms’ clarifying question. Update II: A lot of criticism regarding Part D is directed at the non-interference clause, which prohibits the government from direct negotiation. Repealing this would have a negligible effect, according to CBO. Part of the reason is that it would not be a true negotiation, because the biggest tool the government could use, a restrictive formulary, is left off the table because it’s a political nonstarter. Also, before the MMA was enacted various prescription drug bills were kicking around congress for many years. The vast majority of them — republican and democratic — included this provision. As it stands, drug manufacturer negotiate with the prescription drug plans, who have every incentive to get a good deal. But again, they’re hamstrung by the requirement to have very inclusive formularies. In some class of drugs they’re required by law to include the vast majority of the available prescriptions — in every therapeutic category its at least 2 drugs. Regarding re-importation, the law gives HHS the authority to do it, provided that the department can certify it can be done safely. FDA is worried about counterfeit drugs, tampered drugs, etc. There’s also the R&D argument. Haven’t spent too much time on this issue, but the NIH looked at it a few years back. Personally, I think it’s a band-aid approach to more systemic problems in the overall health care system. On episode 86 of The Richocet Podcast, James Lileks, Peter Robinson, and my favorite conservative, Rob Long, discuss the 2012 election with Michael Barone and Haley Barbour. If you’re interested in election politics, the full discussions with Michael Barone and Haley Barbour are worth listening to (starts around 5:30). If you just want to hear Rob Long (my favorite conservative) rail against the bankers, making the case that the folks who helped get us into this crisis should be broke and selling apples on the street, fast forward to the last 20 minutes (starts about 58:00), and listen to him go. The real populism (and punish the bankers rhetoric) starts at 1:02. As a RINO, conservative-ish moderate, I tend to resent that the forums for conservative thought are dominated by (and, sometimes, I think, being squashed by some who may be rabble-rousing poseurs) Glenn Beck and Sean Hannity and others. I like Rush Limbaugh, and though I rarely listen to his show these days, I listened regularly for 10 years, and I like the show. But I don’t think that style, which is about 80% bloviation (entertaining) and 20% substantial content, should not be the only thing that represents conservative thought in the public forum. I find talking heads shouting at each other on Fox even less appealing (and not reflective of the depth of any side of any argument). That’s why I like Ricochet. I bet most folks on the left (not you fine people here, but elsewhere) would be a little surprised by Haley Barbour, or the kind of dialog that goes on between conservatives when they have a broader canvas than 5 minutes on Fox. Or Jonah Goldberg. Common lampooned as an idiot or demon, even very liberal folks would have a hard time getting that vibe if all they had to go on was his appearance on episode 87 of Ricochet: Looking for a Hero. I don’t have any specific call-outs for that episode, but there’s a lot of discussion of the 2012 race, with a lot of hard-headed, no-nonsense analysis from the conservative side. The title makes me think of Frou-Frou’s cover of Bonnie Tyler’s I Need a Hero. Love that cover. But I love covers, generally. I don’t know how many of you have been following the “Occupy Wall Street” protests but I thought this was a decent historical perspective of the movement. There’s a great tradition of populist anger against the economic elite. The protesters don’t seem to have any real leadership or defined goals, they appear to want it that way, but they are reflecting similar complaints going all the way back to the Shay and Whiskey Rebellions. But a lot of efforts to state a goal for the protest itself devolve in sloganeering about the economic situation and self-admiring paeans to the virtues of protesting. Wouldn’t galvanizing this stuff require… leadership? Our founding democratic-finance activists weren’t such communitarians that they refused to have leaders and set achievable goals. They were used to being rank-and-file — even though as miltiamen, they elected their leaders. Most Bank of America customers will soon see a new charge on their statements — $5 for any month in which they use a BofA debit card to make a purchase. The new Bank of America fee will be phased in early next year, said Anne Pace, a spokeswoman for BofA, the nation’s largest retail bank. Customers will still be able to use their cards at the bank’s automated teller machines without being charged, the bank said Thursday. They also can make debit purchases free if they have a mortgage from Bank of America or if they have a total of $20,000 on deposit at Bank of America and in certain Merrill Lynch accounts (you may recall that Bank of America’s corporate parent bought Merrill Lynch as the financial crisis set in). An energy company lobbyist and former top aide to Gov. Rick Perry was chosen Thursday to lead the 12,000-employee Texas Department of Transportation and will be paid at least $100,000 more annually than the career engineer he succeeds. lpartment of Transportation and will be paid at least -…$1more annually than the career engineer he succeeds. Experience: Engineer. Worked for 33 years for TxDOT. Experience: Lobbyist, executive for Luminant Energy. Texas secretary of state for one year. Aide for 15 years: U.S. Sen. Phil Gramm, Gov. 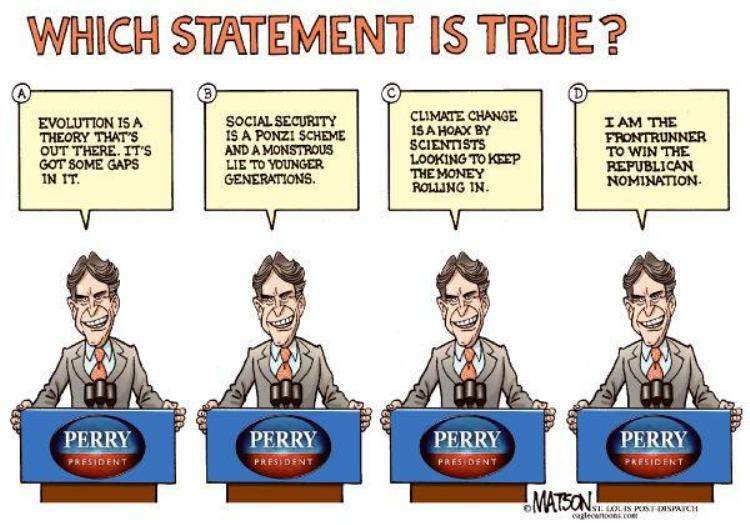 Rick Perry. Note from me: This new salary is the max allowed for a state employee, but they are going to try to gain an exemption to pay Wilson even more. If you’ve never seen the Star Wars Gangsta Rap, you should. Because it’s fun, and fun is good. Speaking of fun, you should also watch Muppet Bohemian Rhapsody, if you haven’t. Of course, it helps if you’re familiar with Queen’s original. It’s really well done. Some other stuff might go here. Like this! Chastity Bono appearing on the Sonny & Cher show around age 3. Speaking of Health Insurance . . . .
Health insurance premiums burst upwards. Ack! The ACA! It does nothing! Nothing! The average employer-sponsored, single-person health plan premium rose by 8 percent to $5,429 from 2010 to 2011. Meanwhile, the average cost of family coverage rose by 9 percent to $15,073. By contrast, inflation rose by just 3.2 percent, while wages increased just 2.1 percent, the foundation said. “This year’s 9 percent increase in premiums is especially painful for workers and employers struggling through a weak recovery,” said Kaiser President and CEO Drew Altman. Everywhere you look, it’s good news!